The wildfires that struck Rafina, north east of Athens, have now claimed at least 80 lives with the number set to rise as many are still missing. This terrible catastrophe shows the interaction of climate change and austerity, both the result of a society that puts people before profit. 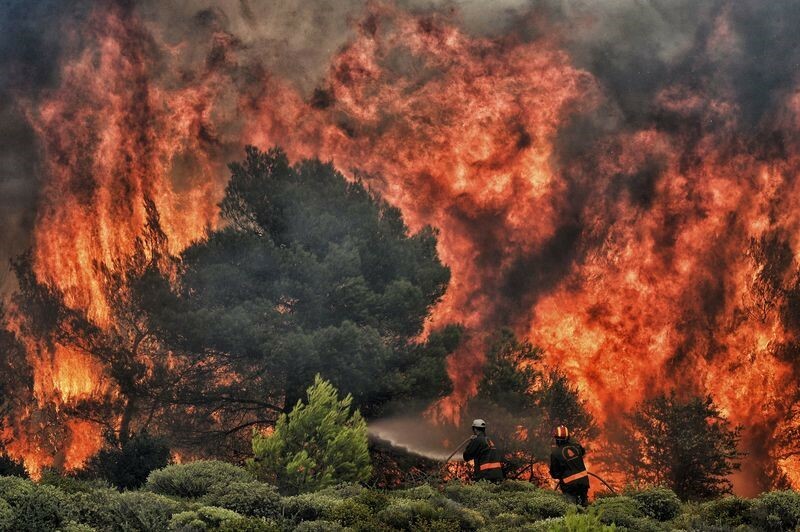 The fires in Greece take place in the context of an intense heat wave that is global in scale and has produced fires not only in Greece but in Northern Sweden above the Arctic Circle. Brid Smith TD visiting her sister in Sweden reports temperatures of 32C in the shade and 40C in the sun. In hotter parts of the world such as Algeria and Iran they are soaring well over 40C and approaching the limits of human habitability. Fires, floods , droughts and intense storms – extreme weather in all its different forms – is what climate change means, not just rising sea levels in the future, and they are happening now. The world’s governments have known this was coming for at least 30 years, since the establishment in 1987 of the Intergovernmental Panel on Climate Change (IPCC), if not before. But because of the commitment to short term profit and hence to the oil and gas industries and to fossil fuels, they have chosen to fiddle while the planet burns and now we are starting, only starting , to reap the whirlwind. But there is another crucially important factor in the Greek disaster – the crushing austerity programmes imposed on the Greek people by the EU and slavishly implemented by the Syriza government. As a result the fire service budget has been cut by over €100 million since 2007. And this in a country where wildfires are a regular phenomenon. 4000 fulltime fire fighting posts have been cut since 2011. At the same time 700 firefighters have been made available for privatised airports and roads. This criminal social vandalism is just part of a much wider cuts programme that has decimated all the social services to which victims of the fires will now have to turn. Another feature of the catastrophe worth mentioning is the fact that migrant community organisations have issued calls to their members to rally round and come to people’s aid, and among the heroes of the rescue operations, lifting people from fire threatened beeches were Egyptian fishermen. These are precisely the people who have been targeted by the Golden Dawn fascists, some of whom are currently on trial for the murder of an Egyptian fisherman. At the same time the Turkish Firefighters Union has issued a statement of solidarity and offered assistance – an important stand in a situation where Turkey is the traditional ‘nationalist’ enemy. Finally the parallels with Grenfell are all too obvious. All these things- the refusal to tackle climate change, the decimation and privatisation of public services, the disproportionate impact on working class communities – have a common root in the capitalist system’s relentless pursuit of profit over the needs of ordinary people.